To celebrate our new commercial partner, and welcome RRG Salford Quays to our family of corporate supporters, we decided what better way to announce such a partnership than by letting SRDFoundation Sales Manager Des review the new Foundation and Club branded Toyota GT86, supplied to us by RRG for the new season. While we know the Salford Red Devils look to be motoring on the pitch, let's see how the branded sports car does on the track... Over to you Dezza. In the good old days, when children were covered in soot and men were more Andy Gregory than Andy Murray, cars had skinny little tyres so that enthusiastic drivers could have fun making them slither about on roundabouts. Slither like Rangi tearing through a Yorkshire raised back line, or such. In fact, all modern cars cling to the road like an Australian clings to a rugby league ball in the Rugby League World Cup Final. And while I like to throw a shrimp on the barbi as much as the next man and most cars are front wheel drive these days, this being a rear wheel drive gives us a rare opportunity of a actually driving a car without child stabilisers. Which brings me neatly to the door of this week’s test car. It’s the Toyota GT86 and unlike most coupés the GT86 is not a hatchback in a party frock. This is the real deal. It is not a marketing exercise designed to relieve the Cheshire set and the style-conscious of their surplus cash. It isn’t even that good-looking in the classical sense. Or practical. Like a loyal and fun, but less liberal minded girlfriend, the boot is large enough for some things sure enough, but you can forget about putting anybody in the back (unless your the Hamster). Power? Well not half. It has a 2-litre boxer engine delivering 197 brake horsepower. And while not an astronomically high number, with the car weighing just 1,275kg and the engine is so revvy, you’ll hit 62mph in 7.6 seconds and a top speed of 140 mph plus. Your standard BMW M3's will not be as cocky anymore and your Subaru Impreza's either. There’s no mistaking the noise. This car is loud, and not in a particularly nice way (Wink). I have a smile on my face every time I drive it. People must think i'm a nice guy smiling at everyone I pass or meet at the lights. little do they know I'm an angry scouser (ha ha). It’s just the violent sound of petrol exploding in a metal box... A thing of raw, beauty, Salfordian, Red Devil-esque agression. In a rear wheel drive car the front wheels are left to get on with the job of steering while those at the back handle the business of propulsion. It’s expensive to make a car this way, and complicated, but the end result will be better, more balanced... FASTER!...a true drivers car. Because the steering is perfectly weighted and full of juicy feel, the GT86 will unlock a talent you didn’t know you had. It will unleash your hero gene and you will never want to drive any other sort of car ever again. Not having to prove how fast this car really is when stopping at a set of lights and looking to your right at a boy racer who turns up, i kindly smile (as above) give them a nod and let them go on there way. yes gents this is the real deal. With the traction control off I suppose I could raise a safety question (giggle). Because, while its antics are a massive giggle on a track, I do wonder what will happen when it’s raining and your head is full of other things and you try to go round a roundabout at 25mph. There’s a time and a place for oversteer and I’m not sure 5.30pm coming off the Barton Bridge roundabout. Best in these circumstances, then, to turn the traction control on. Frankly, I wouldn’t change a thing about the GT86. Because it’s so spartan in its design and function, it doesn’t attract too much attention. You can therefore have fun without being marked out by passers-by as an anorak, or a flash t%@t. Unless you opt as we did to rebrand it with Salford Red Devils Rugby Club & Foundation branding and paraphernalia… Avoid this and you should be just fine. And now we get to the clincher. The GT86 costs less than £25,000 with manual transmission. That makes it cheaper than a Vauxhall Astra VXR (which comes with masses of understeer). It makes it a Salford Red Devils purchase for the price of your typical shopping trolley. 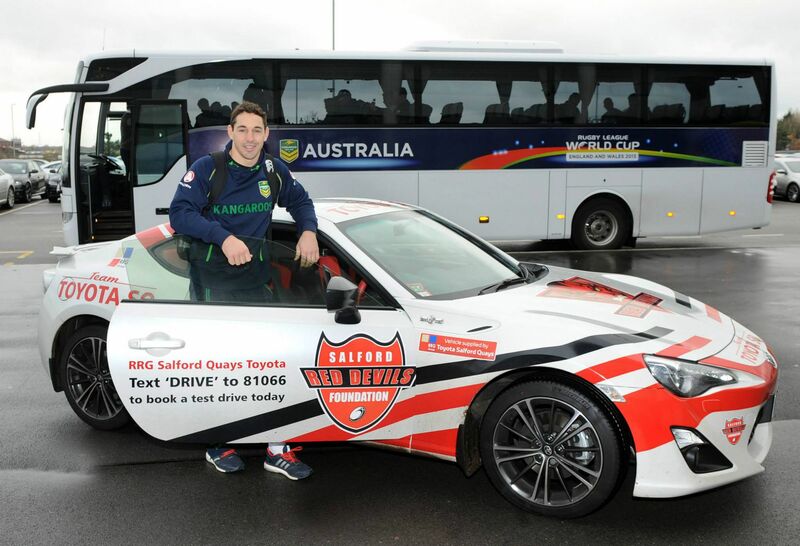 Salford Red Devils Rugby Club & Foundation are delighted to announce RRG Group Salford Quays to our family of corporate sponsors, having gifted us a branded Toyota GT86 for the season. For more information on any of Toyota RRG's Vehicles, or to arrange a test drive, call 0161 745 7766 quoting reference DES.